We’d love your help. Let us know what’s wrong with this preview of A Lesson Before Dying by Ernest J. Gaines. To ask other readers questions about A Lesson Before Dying, please sign up. what do you guys think really made Jefferson to take the 'Hog' name seriously? was the conflict of this novel resolved? How did I feel at the end of this book....uplifted and beaten down, both. All the love and all the hate and all the even more stultifying indifference. All the indignity and indignation. So many very heavy feelings spread through this sad story, but there are moments of redemption if you watch carefully for them. Many already know of the story...the teenaged boy who is in the wrong place at the wrong time and ends up sentenced to death. His family wants him to die as a man...and wants--no demands How did I feel at the end of this book....uplifted and beaten down, both. All the love and all the hate and all the even more stultifying indifference. All the indignity and indignation. So many very heavy feelings spread through this sad story, but there are moments of redemption if you watch carefully for them. Many already know of the story...the teenaged boy who is in the wrong place at the wrong time and ends up sentenced to death. His family wants him to die as a man...and wants--no demands--the plantation teacher assist in this job. Many people change during the course of this story, including any thoughtful readers. With raw, unflinching honesty and a brilliant depiction of time and place, this is the story of a young, black man sentenced to death for being in the wrong place at the wrong time. A white man was shot to death, the other two perpetrators dead, someone must be held accountable. A young school teacher, returned to the quarters to teach the black school children, and now enlisted by his aunt and the condemned man's nana to help the man go to his death as a man, not as an inhuman man, not much bett With raw, unflinching honesty and a brilliant depiction of time and place, this is the story of a young, black man sentenced to death for being in the wrong place at the wrong time. A white man was shot to death, the other two perpetrators dead, someone must be held accountable. A young school teacher, returned to the quarters to teach the black school children, and now enlisted by his aunt and the condemned man's nana to help the man go to his death as a man, not as an inhuman man, not much better than a hog, a thing, not a person. Poignant depiction of strong women, women who had to be since so many of the men had left and not returned. This account of a school teacher's attempt to bring dignity to the last days of a condemned man in 1940's Louisiana is moving but still somehow disappointing. Shortened, it would have made a fine novella. Jefferson, a poor, uneducated twenty-one-year-old Black was standing in the wrong place at the wrong time--in a small-town liquor store outside of Bayonne, Louisiana. It is the 1940s. Three men are killed. He is the only survivor. He is “tried”, convicted and sentenced to the electric chair. His “nannan” has one request. She asks that Grant Wiggins, a teacher at the church school, be allowed to speak to him. Let him die not as a “hog” but as a man. Those I dare you to read this and not be moved. His “nannan” has one request. She asks that Grant Wiggins, a teacher at the church school, be allowed to speak to him. Let him die not as a “hog” but as a man. Those are her words, not mine. Will Grant succeed, or won’t he? That Jefferson is to die, is not up for question. This is a book that is about dignity and strength. It is about racial prejudice and discrimination in the South. It is about real kindness, by that I mean giving not what you want to give but what another needs. It is about education and what it has to achieve, its purpose. It is about faith and religion. I believe it will satisfy both those with and without religious beliefs. And more--about what keeps a person alive, about last requests and about the inhumanity of the death sentence. That is an awful lot for such a short book. In my view the author does succeed with all these topics masterfully. The characters’ words and actions are well chosen, making the tale succinct and powerful. Th audiobook narration is executed by Lionel Mark Smith and Roger Guenveur Smith. I had some trouble understanding specific words in the beginning. Was the word I was hearing, “hog”, what I was supposed to be hearing?! Then it cleared for me; yes, it was! The black, Southern dialect is strong, and it should be. The tempo is perfect. The narration is remarkably well done, so this I have given five stars. In my view, this is Ernest J. Gaines best book. “But let us say he was (guilty). Let us for a moment say he was (guilty). What justice would there be to take his life? Justice, gentlemen? Why, I would just as soon put a hog in the electric chair as this.” - Ernest J. Gaines, A Lesson Before Dying. Jefferson, an African-American man living in Louisiana in the late 1940s, is accused of a murder he didn’t commit. His lawyer uses the “hog” defence to get him off; however, this is unsuccessful and Jefferson is sentenced to death. Jefferson’s godmo “But let us say he was (guilty). Let us for a moment say he was (guilty). What justice would there be to take his life? Justice, gentlemen? Why, I would just as soon put a hog in the electric chair as this.” - Ernest J. Gaines, A Lesson Before Dying. Jefferson, an African-American man living in Louisiana in the late 1940s, is accused of a murder he didn’t commit. His lawyer uses the “hog” defence to get him off; however, this is unsuccessful and Jefferson is sentenced to death. Jefferson’s godmother feels the importance of Jefferson dying as a “man” not as a “hog”, so she enlists the narrator, Grant, to teach Jefferson how to be a man so he can die with dignity. Grant was an interesting character in that he was the only educated black man in that community; the community expected a lot from him and the immense pressure he was under was evident. Add to that his questioning of the Christian faith and a complicated romantic relationship. A very moody character, I’m not sure how I felt about him. This was definitely a moving book. It stirred up feelings of indignation in me for sure. The third Ernest Gaines novel I've read gets another 5 stars from me. Just as in "The Autobiography of Miss Jane Pittman" and "In My Father's House", I was not quite the same person as I turned the last page that I was when I began. There was a tiny seismic shift inside me that I recognized as another piece of understanding in this complicated dance of racial relations between black and white. A simple story on the surface: Young Jefferson, a black man, is in the wrong place at the wrong time and The third Ernest Gaines novel I've read gets another 5 stars from me. Just as in "The Autobiography of Miss Jane Pittman" and "In My Father's House", I was not quite the same person as I turned the last page that I was when I began. There was a tiny seismic shift inside me that I recognized as another piece of understanding in this complicated dance of racial relations between black and white. A simple story on the surface: Young Jefferson, a black man, is in the wrong place at the wrong time and is sentenced to the electric chair. His Godmother, Miss Emma, asks the local schoolteacher, Grant Wiggins, to visit him in jail and make him understand that he is not a hog with no understanding as the prosecutor decribed him, but a young man that she is proud of. The outcome is known from page one, but the journey is long, complicated, and heart-rending. This is Louisiana in 1948, and the white man is in charge. As in the other two books I mentioned, the women in this novel are the strong ones, and get things done. Miss Emma and Aunt Lou get what they need through a combination of guilt, bribery and respect. They never hesitate to use them, even on the white people. They know what works. So, apparently, does Ernest J. Gaines. His language is simple and direct, but he can convey a world of emotion and feelings in just a few words. He made me feel humiliation and anger and hurt so many times with just a description of a glance or movement. He made me see that the black man's understanding of the white man has to be many times that of white for black, just as an act of survival. A lesson Before Dying is a very MOVING book. By reading most of the other reviews I'm sure everyone understands what this novel is about. I'm not positive if I would have appreciated this book in High School had I read it 10 years ago. I would like to thank Mr. Gaines for his lessons!! I've typed out a few powerful passages that moved me...There were more but these are just some I made sure I highlighted! A hero is someone who something for other people. He does something that other men don't an A lesson Before Dying is a very MOVING book. By reading most of the other reviews I'm sure everyone understands what this novel is about. I'm not positive if I would have appreciated this book in High School had I read it 10 years ago. I would like to thank Mr. Gaines for his lessons!! I've typed out a few powerful passages that moved me...There were more but these are just some I made sure I highlighted! A hero is someone who something for other people. He does something that other men don't and can't do. He is different from other men. He is above other men. No matter who those other men are, the hero, no matter who he is, is above them. I still think about this book, even after reading it months ago. It’s a very simple story about two African-American men in 1940s Louisiana; one is a teacher and the other is a uneducated man waiting to be executed for a murder he witnessed, but didn’t commit. Both of them have given up hope for their lives, and for humanity in general. They live by the rules of the white majority, and both face a bleak future that’s beyond their ability to change. They are forced to spend time together, and eve I still think about this book, even after reading it months ago. It’s a very simple story about two African-American men in 1940s Louisiana; one is a teacher and the other is a uneducated man waiting to be executed for a murder he witnessed, but didn’t commit. Both of them have given up hope for their lives, and for humanity in general. They live by the rules of the white majority, and both face a bleak future that’s beyond their ability to change. They are forced to spend time together, and eventually, they end up teaching each other how noble they are, and how precious life is. I won't lie; it's a very sad book, so you should read it with a box of Kleenex nearby. But it's not tragic. There's a great message that you'll carry away from it. Ernest J. Gaines' 'A Lesson Before Dying' is a tedious read that has a good story, but ultimately falls flat mainly because of shallow characters and flat writing. However, if you are looking for a short, quick-read novel about African-Americans and whites during racial segregation in the style of 'To Kill a Mockingbird', this might be your cup of tea. But ultimately, there is nothing enlightening, heart-wrenching, or poignant about this novel. 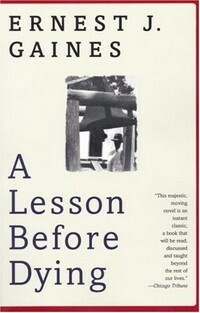 Many of the issues lay within the main character, Gr Ernest J. Gaines' 'A Lesson Before Dying' is a tedious read that has a good story, but ultimately falls flat mainly because of shallow characters and flat writing. However, if you are looking for a short, quick-read novel about African-Americans and whites during racial segregation in the style of 'To Kill a Mockingbird', this might be your cup of tea. But ultimately, there is nothing enlightening, heart-wrenching, or poignant about this novel. Many of the issues lay within the main character, Grant Wiggins, a bitter school teacher who complains about being in his 'stifling' Louisiana town, complains and berates family members and students, yet ultimately doesn't do anything about his situation regardless of what he says or does. I have never encountered a character more bitter, cold, or just plain selfish than Grant Wiggins. Nothing ever seems to please him, and everyone seems to be at the sword's end with Grant - from his aunt and her friends, to his pupils, and even sometimes his girlfriend. While the book is supposed to be about Jefferson, a young black male sentenced to death, there are actually few moments when the reader encounters Jefferson - most of the time, it's just Grant, and what he doesn't like, and how his Aunt and her friend are looking at him, how he wants to leave but doesn't leave, how he acts 'smart' with the whites and they don't like it, so on and so forth. There is so much conflict and anger that rolls off the pages whenever Grant is narrating it becomes tiresome and boring. This is not a page turner, and it takes several chapters to get into the actual story. The characters, other than Grant, are not very memorable and lack depth and clarity - they seem to be simply the dumb marionettes while Grant is the smart and superior, albeit angry, craftsman. Mr. Gaines' writing also does not help to make this book even somewhat-passable by any standards. It seems almost dull, bored, and disinterested - as if he wasn't really invested in the writing from the start. The beginning of the book gives you hope, but after that, it all falls downhill from there and picks up too late, only until the absolute end. Thus, the writing leaves an empty hole in the center of what should be a fiery sea of emotion and personal connection. An incredibly powerful novel that peels back the curtain of injustice, laying bare human pride and prejudice, rooted in fear, and how one person can be the fertile ground for positive change. And each of us are potentially the "one." This novel, though centered around a man sentenced to die in the electric chair for a crime he most likely didn't commit, it is more of a story about executing the sin of pride which causes all humans to stumble. Another wonderful read by Gaines. This is heavy on the heart. The question comes to mind, "who was the teacher?" Lots of role reversals in this one. Gaines is an author to be trusted, he knows exactly how to handle his reading audience. He sure can stir the emotions but he also stirs the mind. Jefferson, a simple black laborer, found himself in a liquor store during an armed robbery. The innocent man was in the wrong place when the owner was murdered, and he was convicted of the crime in the late 1940s. The public defender had tried to convince the jury that Jefferson was not intelligent enough to plan the crime. The teacher Grant Wiggins described the trial: "He said it would be like tying a hog down into that chair and executing him--an animal that didn't know what any of it was all Jefferson, a simple black laborer, found himself in a liquor store during an armed robbery. The innocent man was in the wrong place when the owner was murdered, and he was convicted of the crime in the late 1940s. The public defender had tried to convince the jury that Jefferson was not intelligent enough to plan the crime. The teacher Grant Wiggins described the trial: "He said it would be like tying a hog down into that chair and executing him--an animal that didn't know what any of it was all about. The jury, twelve white men good and true, still sentenced him to death. Now his godmother wants me to visit him and make him know--prove to these white men--that he's not a hog, that he's a man." The book shows the prejudice of the Jim Crow Era in the way the black people are treated, especially in the deep South. Even Grant, an educated man, is treated in an inferior manner, having to come in the back door and wait for hours to speak to a white man. But if he moves from his rural Louisiana town to another region of the country, he will have to leave his roots and people he loves. A young, poorly educated black man – Jefferson - is sentenced to death despite being innocently present in a failed robbery when two black robbers and one white shopkeeper killed each other. The defending attorney tries to prevent the death sentence by saying it would be more like executing a hog than a civilised human being. As a result Jefferson’s elderly churchgoing grandmother and her friend, the narrator Grant’s Aunt, decide that the narrator – a teacher in the local school – have to teach A young, poorly educated black man – Jefferson - is sentenced to death despite being innocently present in a failed robbery when two black robbers and one white shopkeeper killed each other. The defending attorney tries to prevent the death sentence by saying it would be more like executing a hog than a civilised human being. As a result Jefferson’s elderly churchgoing grandmother and her friend, the narrator Grant’s Aunt, decide that the narrator – a teacher in the local school – have to teach him to be a man before he dies. In addition the local preacher also visits Jefferson – to try and save his soul. The teacher is in some ways the only educated person (black or white) in the story – but in some ways the least educated due to his lack of faith or real inner happiness or peace. The book’s theme is clearly meant to be the racial divide in America – and in particular the vicious cycle the black community in the old plantation areas has been in ever since slavery – where the men either; stay, are broken and conform to the lowly role the whites expect of them; run-away and often meet a violent end; or become educated in which case the only way the feel able to break away is to leave the area. For me this part was rather forced with lots of racial stereotypes (e.g. the whites are all old fashioned redneck’s with one token exception) but the book did show up a community with a huge lack of integration – the whites still expect the blacks to call them sir, segregation is still strictly in force and the mixed races delight in looking down on the blacks. It also showed the evil perpetuated by the death penalty. Book is sad and moving in some ways but not in the end a good piece of literature as too clichéd and predictable. The book takes place in Louisianna. A black man who was a slave on the cotton farms was wrongly accused of murder and was sentenced to death by the electric chair. The book is about the last few weeks the man has on earth. A black teacher was sent to him each week to convinced him that he was worth something and that he was a man. He convinced him to believe in God and ask for forgivness of his sins. He did so to please his aunt. He walked to the This was one of the best books I have ever read. The book takes place in Louisianna. A black man who was a slave on the cotton farms was wrongly accused of murder and was sentenced to death by the electric chair. The book is about the last few weeks the man has on earth. A black teacher was sent to him each week to convinced him that he was worth something and that he was a man. He convinced him to believe in God and ask for forgivness of his sins. He did so to please his aunt. He walked to the electric chair like a man. I recommend this book to all readers. It also causes one to do some introspection on his or her own life and beliefs. A black man is wrongly accused of a crime he did not commit, and a schoolteacher is given the task of helping him face his punishment like a man. The facts seem simple, but there is so much more to this little book. Through Grant Wiggins, the articulate yet conflicted narrator, Ernest J. Gaines presents the plight of downtrodden African Americans in the South. Yet he also makes the reader confront what it means to be truly human, and to face one's destiny with true courage. What a powerful story. This goes to my classics shelf immediately. This is the kind of great book that makes you wonder how you could have passed it over for so long. Instant respect for Ernest Gaines. I did not want the month of February to go by without reading at least one book by a black author. Wow, am I grateful that my library had this title on display. A book I've meant to read for a long time and now I know why. What an emotional wallop. From the opening pages where a public defender "defends" a black man by comparing him to no more than a hog, to the powerful closing pages of Jefferson's jailhouse diary, I was caught in 1940's Louisiana and the injustice of a racist society. What is to I did not want the month of February to go by without reading at least one book by a black author. Wow, am I grateful that my library had this title on display. A book I've meant to read for a long time and now I know why. What an emotional wallop. What is to stand like a man? This ageless, timeless question dominates the novel. It's a question without an easy answer and Gaines' characters stumble through humbly, defiantly, confusedly, longingly. What drives the pace and momentum is the execution date. Will Grant Wiggens be able to convince Jefferson (or himself) that he is a man? That it even matters? I loved everything about the questions asked, the questions answered, the writing and setting and characters. It all made me incredibly sad, but even that was satisfying. Gaines never wastes a word in telling this story and all I want is more. Someday I will die. That I am sure of. But I do not think about it, at least, not consciously. I wouldn't want to think that a time will come when light, breath, and little breezes are things I will not experience. And never again see that little, oh, so beautiful smile in her eyes. But it will come, all the same. When? Tomorrow? Next year? Fifty, a hundred... well maybe say seventy years at the most. That was a passing thought. Sad it was caught on record. Well, think of a man who knows that he Someday I will die. That I am sure of. But I do not think about it, at least, not consciously. I wouldn't want to think that a time will come when light, breath, and little breezes are things I will not experience. And never again see that little, oh, so beautiful smile in her eyes. But it will come, all the same. When? Tomorrow? Next year? Fifty, a hundred... well maybe say seventy years at the most. Well, think of a man who knows that he shall soon die. And the date is set. He counts the days, and in his solitary confinement has to deal with the ever present fact that the clock is still ticking, closer to the appointed day. The day he will meet his death, in an electric chair. This knowledge, the thoughts it inspires, is more torture than anything I can imagine. His name, your adopted name for the second, is Jefferson. His narrative voice, sad but deepened by wisdom as it is sharpened by doubt and pain, is like seating by a fire and listening to an old man whose tranquility exudes and soothes. Totally unrelated, by the way. Just sad. I felt like the author could have done a better job of making interesting characters with multiple dimensions. The only two characters that were even attempted to be portrayed as interesting, evolving people were the two main characters. Everyone else was essentially static representations of a particular caricature (i.e. the girlfriend who represents everything good, the grandma who represents piety, the sheriff who represents bigotry, etc, etc). And even the two characters This book was okay. The older and, one hopes, wiser I grow, the more I admire and respect simplicity. Simplicity is not simple. Simplicity means clean lines, all that is unnecessary pared away. Simplicity means choosing that one golden word where ten would only confuse the issue. And, that one word can be clear and true. Ernest J. Gaines is a master of simplicity. A Lesson Before Dying is clean and clear writing, descriptions that say just enough to evoke an entire scene with all senses engaged, all heart and mind The older and, one hopes, wiser I grow, the more I admire and respect simplicity. Simplicity is not simple. Simplicity means clean lines, all that is unnecessary pared away. Simplicity means choosing that one golden word where ten would only confuse the issue. And, that one word can be clear and true. Ernest J. Gaines is a master of simplicity. A Lesson Before Dying is clean and clear writing, descriptions that say just enough to evoke an entire scene with all senses engaged, all heart and mind present. His dialogue is bare bone, sparse as the dialogue I so admired as a young writer-in-training, enthralled with that other Ernest—Papa Hemingway, and his unique way of capturing the way that people actually speak rather than the stilted narrative voice of the author him or herself. “It don’t matter,” I heard him say. He was looking up at the ceiling. “Nothing don’t matter,” he said, looking up at the ceiling but not seeing the ceiling. He looked up at the ceiling, not seeing it. “Chicken, dirt, it don’t matter,” he said. Ah yes, there is that mastery, like a reincarnation of Hemingway, with an artist’s understanding of the way that life moves—not in straight lines, but in circles, ever circling on the same spot, trying out its parameters until it is known, only then shifting to the next circle, a slight distance this way, or that, or even back again. I admire this accuracy portrayed in the written word. The novel becomes life. The life portrayed in this novel is based on two main characters, set in 1940s Louisiana, the deep south, when racism and segregation ran deep, and a black man was imprisoned just for being in the wrong place at the wrong time, innocent that he might be. Jefferson is a simple-minded man who inadvertently ends up in the middle of an armed robbery, and although he has done nothing wrong, is sentenced to die by a legal system that has nothing to do with justice but everything to do with enforcing the status quo. Grant Wiggins seems, at first, Jefferson’s opposite—a black man who is educated and intelligent, a teacher at a church school. Both men, however, live in a prison, even as only one of those has tangible bars. When Jefferson is called “same as a hog” by his own defense attorney, likening him to a dumb animal in the hopes that the jury will deem him innocent out of sheer lack of enough intelligence to commit a crime, his aunt, Grant’s grandmother, can accept the final verdict of death, but not the image of her nephew dying like an animal. She calls in a favor from Grant, who reluctantly agrees to visit Jefferson in prison and teach him to die like a man. If this injustice, the death sentence of an innocent man, cannot be changed in a deeply racist society, then one’s attitude about it can be. Jefferson bitterly accepts being called a hog—“it don’t matter”—but the story unfolds in those gorgeously clean lines with the meetings between the two men, some of which are nothing more than sitting together in a prison cell for an hour and staring at the ceiling. There are no lectures, no fist-pounding diatribes, no soapbox rantings to vaguely disguise the views of the author in need of getting something off his chest. There is just this fly-on-the-wall observation of two men sharing space, different yet same, both locked into place, both suppressed by their life sentences to a destiny neither deserves but inflicted upon them because of their race. So how does a man become a man? What differentiates a man from a dumb animal? Our teachers are not always those with the highest intelligence quotient. Our leaders are sometimes those who are silent, but walk to their destiny, however unfair, with clean conscience and straight spine. Whatever is done to a man matters little. What a man does to himself, and how he handles the circumstances of his life, is all that matters. Live or die, a man does so with honor. Just or unjust, a man answers to himself if he has lived with integrity. If he has, he can walk through any trial, toward any fate, with his head held high. Edward J. Gaines was born on a plantation in Louisiana, where he is now writer-in-residence at the University of Southwestern Louisiana. Previous books include The Autobiography of Miss Jane Pittman, A Gathering of Old Men, and several others. A very difficult book to rate. I didn't enjoy reading it; I didn't feel particularly connected to or drawn in by the characters, I found the writing somewhat flat. And yet, like many other reviewers, I found myself in tears at the last chapter. And now I find myself wanting to read more of Gaines' work. Don't tell me to believe. Don't tell me to believe in the same God or laws that men believe in who commit these murders. Don't tell me to believe that God can bless this country and that men are judged by their peers. Who among his peers judged him? Was I there? Was the minister there? Was Harry Williams there? Was Farrell Jarreau? Was my aunt? Was Vivian? No, his peers did not judge him - and I will not believe. This is one of the best books I have ever read. I especially liked the development of Grant. I like the fact that he questions the problems and situations around him. He's not content to stay where he is in life and within himself. Jefferson is a young man who finds himself in a situation which wrongly leads to his criminal conviction and ultimately his execution. Grant is a school teacher who is having an internal struggle with whether to stay or leave the state to pursue more opportunities and a better life. The plot unfolds around Jefferson’s godmother’s request which will require Grant to visit Jefferson regularly in prison. Grant grapples with the enormity of the request that’s been made of him. His insecurities and th Jefferson is a young man who finds himself in a situation which wrongly leads to his criminal conviction and ultimately his execution. Grant is a school teacher who is having an internal struggle with whether to stay or leave the state to pursue more opportunities and a better life. The plot unfolds around Jefferson’s godmother’s request which will require Grant to visit Jefferson regularly in prison. Grant grapples with the enormity of the request that’s been made of him. His insecurities and the numerous disadvantages to being black in the Deep South are revealed. We also learn about the decisions he made that allowed his life to turn out differently from Jefferson’s. During Jefferson’s encounters with Grant, we see Jefferson grow from being unresponsive and dejected to open and spirited. He begins writing his thoughts in a notebook and expresses many of the troubling things that he has carried since he was a child. Unfortunately, as Jefferson is progressing, his impending execution is causing accelerated deterioration of his godmother’s health. Through much of this novel we learn about the characters through their choices. Will Grant leave Louisiana or will he stay? Will he step up to the challenge of the request or will he walk away. I grew fond of Jefferson quickly and found myself cheering for him. I understood his frustrations and I empathized with his situation. He felt an obligation to make many of the decisions that he made. It would’ve been interesting to see how his life would’ve turned out had he felt he could choose more freely. Jefferson is incarcerated through the entire novel however, the storyline surrounding him isn’t lacking. Watching his situation unfold was tough – really tough. One of the most powerful chapters in the book reveals the writings in Jefferson’s journal. We begin to understand what he thinks about himself and how that’s influenced by what he thinks other people think of him. It immediately made me think back to something I read elsewhere: No one is born with low self esteem*. And seeing the impact that this had on Jefferson is powerful. A story about race and race relations in the late 1940s. A topic that still resonates in 2015, a notion that I feel makes this novel all the more eye-opening. Jefferson was in the wrong place at the right time- at a convenient store where his two friends decide to rob and kill the store manager. Both of his friends end up dead as well, so there's no one there to witness Jefferson's innocence. He was an innocent bystander. Unfortunately, it is 1940, the store manager was white and Jeff 3-3.5 Stars. Jefferson was in the wrong place at the right time- at a convenient store where his two friends decide to rob and kill the store manager. Both of his friends end up dead as well, so there's no one there to witness Jefferson's innocence. He was an innocent bystander. Unfortunately, it is 1940, the store manager was white and Jefferson is an uneducated black man. He is arrested and sentenced to death by electric chair. His godmother asks Grant Wiggins, a local schoolteacher, to visit Jefferson in prison and turn him into a man before his death. She doesn't want him to grovel or cry or go to the chair as anything but a man with his head held high. This is no easy task- Jefferson's lawyers compared him to a dumb hog, aka less of a man, during his trial, contending that he's too dumb and incompetent to stand trial. The tactic didn't work to get him off, but now Jefferson is numb, and is convinced that he is no better than a hog. Grant's work is cut out for him- how do you prepare a man for death? This is an exceptional book. My Gosh....I might consider reading it again myself. (I had just noticed a GR's friend is currently reading it). Absolutely incredible book. I was on my couch sobbing during parts of it. And it takes a lot to make me shed tears. Great writing. Brings you right into the moment.